Last week I bought a copy of The River Cottage Bread Handbook by Daniel Stevens and I can’t put it down! The first thing I made was Spelt Digestives, which have already become a house favorite. So far I have made them twice, both times serving them Ardith Mae Goat Cheese and a selection of my chutney and cheeses. They look beautiful and taste even better. However, the best thing about them is how easy they are to make. I buy my Oat Groats and Spelt Flower from Cayuga Pure Organics at the Union Square green market and highly recommend you do as well. 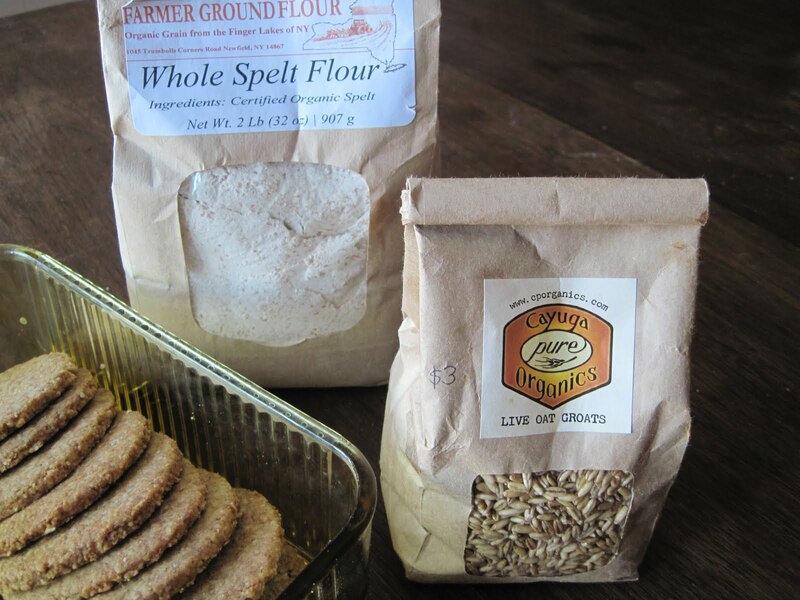 Based in the Finger Lakes, they grow and stone grind the finest local flours available with a large selection that goes way beyond Spelt and Oat groats. I am a big fan of their whole wheat bread flour. Check them out. Anyway, back to the digestives. When I was growing up we used to have digestive biscuits at home all the time as a kid my favorite were the ones topped with the chocolate (shocking right?) These digestives are a little bit more whole grain in their mouth feel, but other than that are totally reminiscent of the digestives of my childhood and would be great vehicles for chocolate as they are on the sweet side. The sugar, however can be reduced of you want. They are perfect with cheese and charcuterie. I made a few adaptations to the original recipe. This is definitely a cookbook you want in your collection! You’ll notice two links in this posting which will take you directly to my Amazon store, a new feature that I am still getting up to speed on. I have started to monetize my site and figured that, given how I suggest so many books, why not set up my own Amazon account? So please, if you are reading this and are going to buy something from Amazon anyway buy it through Urbanfoodguy. I’ll update you more on this as I get the whole thing up and running –this is my first trial run, but I am hoping to have an entire selection of books and kitchenware for you to browse through and purchase very soon. In your food processor place 1 small bag of Oat Groats (2 cups)* and process for 1-2 minutes; the end result should be a powder with some small pebbles of oats still in it. In a large mixing bowl or the bowl of your standing mixer add 2 cups plus 3 tablespoon of Spelt flour, the ground Oats, 2 teaspoons salt, 2 teaspoons baking powder, 2/3 cup Demerara sugar (or brown) and 1 cup plus 1 1/2 tablespoons of room temperature unsalted butter. Mix with your fingers or the paddle attachment of your Kitchen Aid until well incorporated. Add enough whole milk or half and half to form the dough into a slightly sticky ball. Wrap in parchment or a recycled plastic bag and refrigerate for a half an hour or so. You can make this in advance, just be sure to leave an hour or so for it to soften at room temperature as it will get very hard if it completely chills. Cut the chilled dough into 4 balls. Using 2 pieces of parchment paper place 1 of the 4 balls in between the two sheets and roll it out to the thickness you want your biscuits (1/4″). This dough is very brittle – I use a flipper to transfer them from the rolling area onto a parchment paper lined cookie sheet. Because you are not using any extra flour to roll out the dough it is easy to reform and re-roll. Do this with each of the 4 balls until you have used all the dough. Should make around 40. Cook them in batches for about 12 minutes or until the have slightly browned around the edges. If you would like them less sweet reduce the sugar by as much as 1/3 cup. *These can be made with old fashioned rolled oats, when you process them leave them fairly large as they don’t need to be a ground up as the groats. Click below to buy the book and support Urbanfoodguy! This entry was posted in Recipes and tagged Alternative flours, crackers, Digestive biscuits, Oats, Spelt. Bookmark the permalink.